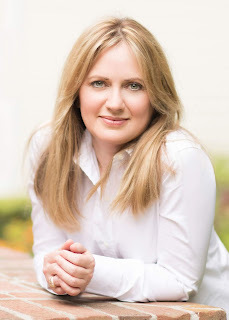 DEBORAH CROMBIE: There's nothing we love more here at Jungle Red than introducing a debut author--especially an author who has won the coveted Malice Domestic Best First Traditional Mystery award! It's a double treat for me as S.C. Perkins (Stephanie!) is a fellow Texan! And, on a personal level, I'm fascinated because we've been talking a lot about genealogy in my family lately. My daughter recently got a subscription to Ancestry.com and we've been investigating our family, using some of the very tips Stephanie suggests. We didn't come up with anything very exciting, but what if you did? We all think it would be cool to find out we were related to someone famous but most of us wouldn't have a clue where to start looking. Good thing we have S.C. Perkins to tell us! Looking back, it seems only natural I would make Lucy, my main character, a genealogist. I’ve heard about my own ancestry my whole life and I’ve always found it as fascinating as the amateur genealogists in my family did! Until I began to explore Lucy’s job, though, I knew next to nothing about how one traces their lineage. Luckily, my hometown of Houston has the wonderful Clayton Library Center for Genealogical Research, and I went to take an introductory class. They imparted so many good tips and interesting facts, and I thought I might pass a few of them along. You know, in case you’re a newbie like me and just as lost! To begin with, when looking for your people, start with the census. · Census records are not published for 72 years after the year they’re collected. This means the most currently available census is for the year 1940. The 1950 census won’t be available to the public until 2022. · The first few censuses (1790–1840) listed only families and were usually based on tax records and voter records. 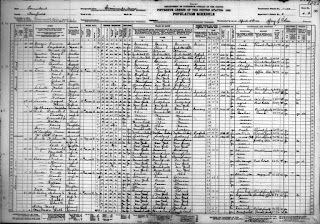 · In 1850, the census became more detailed. Individuals were listed, not just families. There were also two separate census schedules starting in 1850, one for free persons and another for slaves. Ö the year they immigrated to the U.S.
· The word wife was not written until 1870. Before then, an adult woman listed in the household was merely assumed to be the wife. 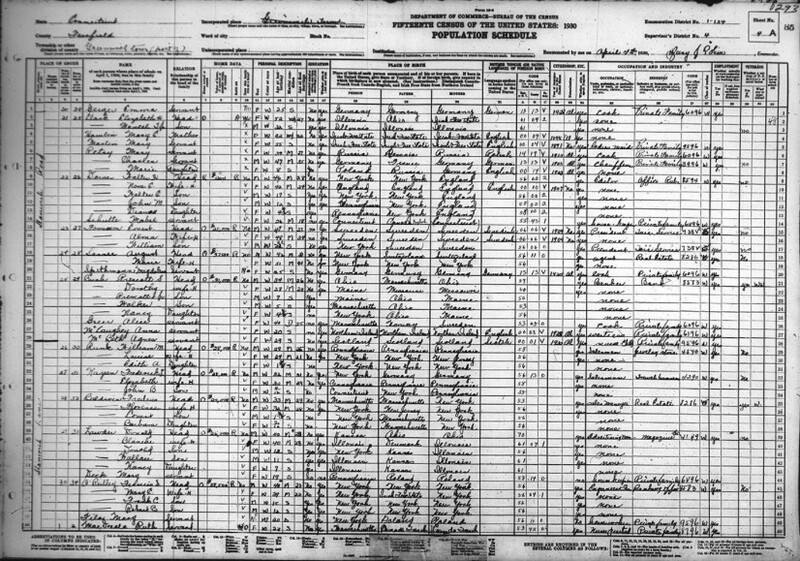 · The 1890 census records burned (in 1920). Thus, there is a 20-year gap in available records, with 1880 and 1900 being available, but nothing in between. · Names were often spelled incorrectly, and nicknames were sometimes given to the enumerator—that is, the census taker—instead of the person’s legal name. For instance, while your three-times great-grandmother might have been christened Sarah, you might find her listed as “Sadie” or “Sally” (two common variations of Sarah) on the census. · Sometimes a child was listed as “infant” because there were such high child-mortality rates that a baby may not have been given a name until he or she turned a year old. And, occasionally, a child is missing from the census because the parents merely forgot to mention them! 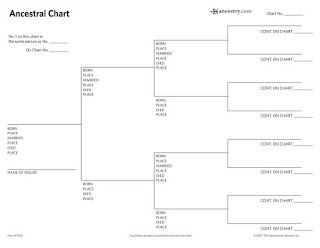 Another good tip is about pedigree charts, also known as ancestral charts. You’ll notice males are even numbers, and females are odd numbers. (The exception is chart #1. 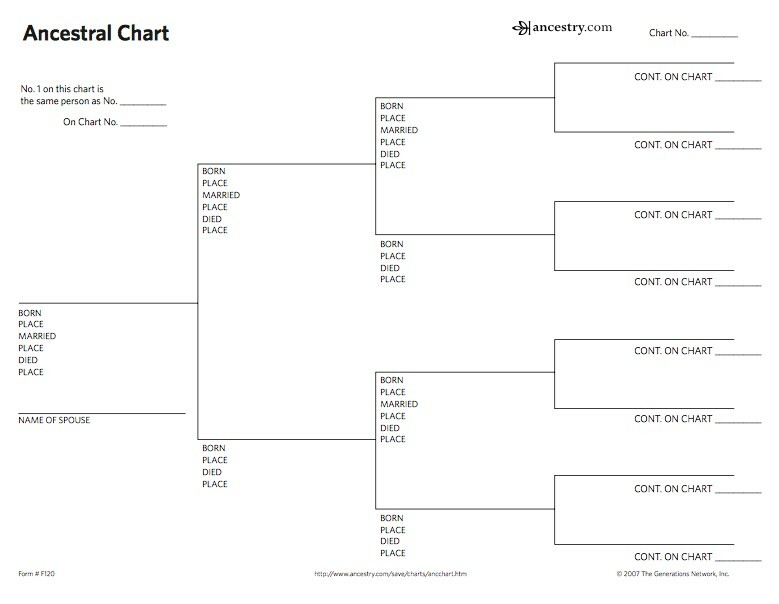 If you are a man mapping out his genealogy, you are still chart #1.) This even-odd system is to help keep your ancestors straight, especially if they have names that could work for a man or a woman, such as Lee or Terry. Yet another good tip is to utilize military records, pension records, and, believe it or not, newspaper gossip columns. · In military records for World War II, there is an “Old Man’s Draft,” (aka the Old Man’s Registration) which listed men aged 45 to 64 and if they had any skills that could be put to use during the war. The information recorded on their registration cards include such information as height, complexion, race, eye color, and other skin characteristics such as moles and scars. · Think one of your relatives was in the clergy, but can’t find him? Look in military pension records. The names of ministers are often found simply because they married someone during a war. · Your female ancestor might also be found in pension records, as the soldier’s wife. · Gossip columns can be informative, too. For instance, marriages were not always announced formally by the family, but the nuptials may have been reported in the social columns of the day. · Probate records, land deeds, and court records are also rich sources when you’re looking for your relatives and their comings and goings. And speaking of court records, don’t be surprised if you find your ancestors were always suing each other and their neighbors. It’s unlikely they were litigious because they wanted to be; suing was simply the best way to resolve disputes! If you’re just starting out and aren’t quite ready to tackle a website such as Ancestry.com or FamilySearch.org, try the National Archives website at https://www.archives.gov/research/genealogy . You’ll find tons of information and links to other resources that can help give you a leg up as you become your own ancestry detective. Also, if your town has a genealogy library or your local library offers an introductory course on searching for your ancestors, take it. They’re informative, helpful, and fun! DEBS: Stephanie will be stopping in to chat, AND will be giving away a copy of MURDER ONCE REMOVED and some fabulous tea to a lucky commenter! REDS and READERS, have you found anything interesting or unexpected in your family history? Stephanie, what great information you've given us in this post! The word "wife" wasn't used until 1870? How interesting. My mother researched our relation to Edward Boone, Daniel Boone's brother, and I have all sorts of genealogical material on that. She did it back in the 60s, when she had to chase paper trails and talk to people in person. I remember going with her and my father, who was the Boone, to talk to people in Louisville, KY. She and my father also visited lots of courthouses and some cemetaries, too. Hi, Kathy! All that paper-trail chasing really was like being a true detective, right? Genealogy is so interesting! And how cool that you’re related to Daniel Boone — after all, he and Edward have the same parents, so their parents are your common ancestor. Love it! Oops, I wasn't through. Hit publish by mistake. Anyway, I love finding out about ancestors and their histories. I have had my eye on your debut book, Stephanie, and I am looking forward to reading Murder Once Removed soon. Thanks for the helpful tips, Stephanie. I had no idea that there was such a delay in publishing census records . . . any idea why? And congratulations on your debut novel . . . I’m looking forward to meeting Lucy. We haven’t done a great deal of research into our family ancestry although we heard a bit about it when we were growing up. But I think the tracing of family trees and discovering your family’s ancestry is fascinating. My grandmother, who was a Shafto, had told us that we were of English ancestry and were related to Daniel Boone, so we haven’t made any unexpected discoveries so far . . . .
Hi, Joan! If it’s true about Daniel Boone, you and Kathy (see comment above yours) may be related! How neat is that? I hope you find your link! Re: census records — I know it’s the law to wait 72 years between census publications, but I didn’t see a specific reason why in my initial research. Now I’m curious and I want to look it up! Joan, are you directly descended from Daniel or one of his many siblings? I'd love to know more. Sorry, Kathy . . . I don't know, but I will try to find out. I've known this little tidbit for years: my grandfather's uncle; or is it his great-uncle, I can never the generation straight; blew up San Francisco - on purpose, at the request of the city government. Uncle Fred was Frederick Funston. General Frederick Funston . APRIL 1906, Uncle Fred was the acting commander at the Presidio when the great earthquake struck. The fire chief was mortally wounded in the collapse of the fire station where he lived, there was no water to fight fire and no communication with the outside world. The army were at war games and couldn't get back to the city. The administration of the San Francisco government asked Uncle Fred to declare martial law, which I think technically he couldn't do without communication with higher authority, and to help stop the fire. Which he did. There were some people who say that the Army went too far in the destruction of buildings, they were too ruthless and sometimes may have been a little hasty in some of their actions but the Army also housed fed and provided Medical Aid to the people of San Francisco not just immediately after the earthquake but, from what I understand, was for many months that followed. Hi, Wendall! Well, no wonder you write mysteries — there’s a bit of ruffian blood in you. I like it! Stephanie, I love this post! Such good information for those who might want to research their ancestors. Great suggestion about looking for a course to help with the search. Fellow Texan here - Central Texas - and I also love the fact that this book is set in Austin. Will I 'see' sights that I'm familiar with? Ha! As a young girl, I came across a genealogy that someone in my grandfather's family started for a family reunion. I found it fascinating. I know quite a bit about my mother's family on both sides from listening to my grandparents and great-aunts tell stories. I've been thinking of do some research and I think I will take your suggestions and run with them. Oh, and also read your book. Congrats on this new series - it will be series, right? Hi, Kay! Thank you so much! It’s early days, but I’m very much hoping it will become a series. I have lots of Lucy adventures to tell! You will definitely see some familiar Austin places when you read, plus a couple I made up. I hope you’ll research your family! I’m new to it, but have many amateur genealogists in my family, so I’ve followed it closely. It’s so fun and fascinating! Be sure to write down some of those stories you’ve heard and try to verify them. Oral history is such a great part of genealogy! My mother and father did the genealogy in the family. I was never really interested in that kind of thing. I always used to tell my mother that unless she found money or a title that I could claim, I had no interest. The one time there was anything interesting to me in their research was when she found out that we were related to the first guy hung for murder in the Colonies. My twisted sense of humor thought that was hilariously cool. Hi, Jay! That’s definitely a talking point! I wonder what he did to be hung for murder? If I remember correctly he shot and killed a fellow colonist. Great info! I dabble in our genealogy when I have spare time sand liked that info about pedigree charts. One thing that is interesting is that so far I haven't found anyone who came via Ellis Island. Many came via Canada, which I didn't realize would have been such a popular option. I am really excited to read your book, thanks for the chance to win! Hi! Thank you so very much! I was interested, too, to find that so many came through Canada. I know I read somewhere why that was, but it’s slipping my mind. There was always a good reason, though. And to think of all they went through to get here in America! Amazing! Our ancestors were intrepid, for sure! Yes! I don't know if you will stop back today, but I found the free things you can print at Ancestry. The log looks good too, I know I tend to go back to things I already have done, since I don't go at it all at once. And I have found relatives draft forms via the Old Man Draft! A great uncle, who was a doughboy in WWI, had a card, as did another, a vet from the Spanish American war. Before we took a trip to Ireland, my husband dug up my one and only Irish ancestor, a Manx from the Isle of Man. After Cromwell executed his father, the boy was shipped off to Dublin for his education and became a Protestant minister. His sons returned to the Isle of Man, and his grandsons emigrated to America and ended up in the Texas hill country. Hi, Margaret! Wow! That’s an interesting ancestor — and his descendants! My mystery writer’s brain is wondering why Cromwell executed his father. Do you know? And the Texas Hill Country is beautiful! Your ancestors made a great choice! I am part of the Wing Family, who came to the Massachusetts Bay Colony in 1632. My ancestor, Deborah Wing founded the town of Sandwich MA. I used to take great pride in this heritage until I realized my daughters ancestry is part Native American. They got to North America first. Their paternal grand father had an interesting life. He joined the navy during WWI (?). Because he was of German heritage, he was harassed. The family story says he assaulted an officer and went AWOL. At this point. he changes his name from Herman Rudolph Preuss to George Weldon Hicks. The next records we can find for him are in Montana where he was a barrel maker. Actually he was a bootlegger. He took a lot of secrets with him when he died. I wish we knew more. Got so excited about my story that I forgot to thank you for the great tips for beginning genealogists. I just reserved your book, and also hope it will become a series. Hi, Coralee! Thank you so much! You know, my Perkins relatives came to Massachusetts in 1633 and helped to establish Boston, before moving just northward to Ipswich, MA, and being one of 7 families to found that township. I think it’s very close to Sandwich, is it not? Anyway, it’s a gorgeous town and I feel a great kinship with MA in general. And to think our ancestors have been in America over a hundred and forty years before America’s independence. That’s really cool! Perkins as in the Perkins School for the Blind where Annie Sullivan was a student? This looks so fascinating! I haven’t done one bit of genealogy work, but I am tempted… But I am hearing so much great buzz about your book! Cannot wait to read it ! Thank you so much, Hank! That means a lot! I first met you in the signing room at Bouchercon Long Beach and you were so kind and gracious. I’m looking forward to seeing you again at Malice and/or Bouchercon! Since my mother was an amateur genealogist, without the internet if you can imagine, I've known quite a bit about my own ancestors. President Lincoln and I share an ancestor who came here in the early 1600s. But only lately did I learn something about the other side of my family. I had always known that my grandmother was 16 when my father was born but I did not know that she "ran off" with a cab driver when she was 15! However, I do find it very interesting that about a month after my father was born there was a notice in the local paper that her parents had the marriage annulled! The really gave me a lot to speculate about. Can't wait to read the book, Stephanie! Now THAT'S got a plot for a crime novel built into it! Hi, Judi! Oooh, I agree with Hallie! That screams mystery plot. As we say in Texas, your grandmother was a pistol, no doubt! What a fun scandal! (Now, at least. I’m sure it wasn’t so fun for your grandmother and her parents back then.) Still, I hope you investigate it! Welcome Stephanie, this is fascinating. And I am off to get your book too. So clever to use this as a backdrop for a mystery! I have added MURDER ONCE REMOVED to my TBR list. It sounds like a fun read! I was never much interested in genealogy, but after my mother's death my sister, who had been Mom's caretaker in her final years, seemed at loose ends, so I did a little preliminary research to get her started and set her the task of researching our family. She hasn't unearthed anything terribly interesting. But we visited with our Louisiana relatives last year, and like many Southerners, it is clear that family history is just part of the lore there. They informed us that our looks favor our maternal grandmother's family, who immigrated from the Canary Islands. I found that interesting! Hi, Susan! Isn’t it so interesting when you can still see traces of your ancestors in your own looks? It gives me the most fun shivers down my spine when I think about it! And the Canary Islands is interesting in itself. Knowing their journey from there to the U.S. would be interesting! This is fascinating and SO informative! Thank you, Stephanie! My husband has done a ton of research on his family. Discovered his grandmother's death certificate (she died just after giving birth) and the death certificate of the baby who died not long after, something no one in the family every talked about. Sad. He's been able to put together quite a genealogy chart. GREAT idea for a mystery series! My daughter and I discovered that my father had a sibling only recorded as "infant." And a brother who died at sixteen. My dad didn't talk much about his family, but we learned that several things that had been handed down as family history, like my father's mother dying when he was very young, weren't true. Hmmm. Thank you, Stephanie! What a fun idea for a mystery series. I'm a genealogy geek - just enough knowledge to disappear down a records rabbit hole but not enough time to really explore. It does get into the question of how much we might want known or might want to know about the past. I always thought that the delay in releasing census data had something to do with privacy since location data is the basis of the survey but with the internet and google earth, I'm thinking that we've already given up that particular protection. With an actual genealogist in the family, I've got all sorts of quirky knowledge on my distant past, including being a descendant of John Proctor from Salem. There's nothing like opening a family records book to see "Hanged as a wizard" in the margin notes. Hi, Lysa! Oh, wow, how cool is that to see “Hanged as a wizard?” (Again, cool for us, but not so much for your ancestor!) Genealogy really is like going down a rabbit hole. But I love all the stories I find, even if they’re less-than happy. Every bit is part of the framework that makes us who we are, and I find that amazing! Thanks for all the great information! I have not started any research on my family but would love to start. 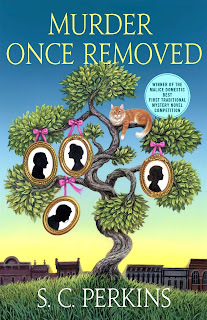 I am adding Murder OnceRemoved to my TBR list. It sounds like a fun start to a new series. Plus, as a Texan I love reading books set in Texas. Hi, Chris! Thanks so much! I hope you’ll enjoy, and I hope you’ll research your family too! Even the little I’ve done has been really interesting! Stephanie, I'm also hooked on genealogy and spend a lot of time on Ancestry. Have you done the DNA tests? Ours confirmed my research (that we're mostly English and Irish) and helped me find relatives to exchange info with. Before Ancestry, I didn't even know the names of my maternal great-grandparents! Your tip about the Census is a good one. It's a great example of non-standardized spelling, using nicknames, etc. I can hardly wait to read your book! Hi, Cathy! My mother and my paternal aunts/uncles have done their DNA, and it’s been FASCINATING. I need to do my own. What I found the most interesting is how I could be, say, 40% English and my full brother could be 20%. Thanks so much for reading and I hope you’ll enjoy! Stephanie, yes, you should get your DNA tested--more material for your books! I found some very interesting and unexpected things, although generations back. Deb — I’m planning on it for sure! Maybe I’ll post my findings once I get it done. Hi, Lyda! Thank you so much! It IS a quite a long competition title, isn’t it? :) Thank you so much for Kindle-ing it and I hope you enjoy! Stephanie--such a timely topic for a series (series, right?!). I've noticed the way law enforcement is using genealogical DNA databases to get hits for solving cold cases--fascinating! And the sometimes twisted trails and tales that come out of doing genealogical research! Perseverance is key to doing family history, for sure. I learned after my Grandfather Church had died (and my dad, who might have been able to answer my questions), that my grandpa had served in WWI. I wanted to find out when and where he'd fought--my dad's younger brothers didn't know. It turns out there was a huge fire in the National Archives in St. Louis in the 1980s; most of the WWI records were lost. But, thanks to the age of the internet, I found a tip on the National Archives webpage and applied to them for information anyway. It turns out that some of the last pay vouchers for WWI soldiers had not been processed and archived at the time of the fire. And, luckily for me, that included my grandpa's voucher. It shows his unit at the time of discharge, his dates of service--once I knew that, I could fill in the blanks. Can't wait to read your debut! Flora, now I want to know where he served! Deborah, the short answer is in the trenches on the Western Front. He apparently came home right before the third and final push of the Meuse-Argonne offensive as the Allies were trying to take two critical German railway junctions. Hi, Flora! My apologies for the late reply. Yesterday was a glorious whilrwind! Yes, perserverence is absolutely the key. And how wonderful that your grandfather’s vouchers hadn’t been entered yet and were saved from the St. Louis fire! That was a tragedy for many a genealogist, no doubt. What your grandfather must have seen! It makes my heart ache to think of the things our soldiers saw in war to make them never want to speak of it. We owe them so much. I’m glad you’re keeping the memory of his service alive in your family! This book sounds wonderful! I have never done any genealogy research, but I find it fascinating. I can't imagine trying to research before the Internet came about though. Hi, Marla! Thank you! Researching would have definitely been harder without the internet, for sure! But I was lucky to have such a wonderful genealogy library to go to. I’ve noticed a lot of local libraries doing introductory genealogy courses, and I think it’s great because there’s so many like you and me who are just starting out and need to know where and how to look. Thanks for the tips, Stephanie! We have shreds and bits of other genealogy, but I'd love to find out more on my own. And delve more deeply into my husband's family tree, too. Hi, Karen! How wonderful that you’ve found your grandfather’s lineage! (And how fun was it to go to Paris to find it?) My paternal grandmother’s maiden name was Runyon, which also originated in France as Roignon or similar. Probably around the same time as yours. I need to do as you did and go to France to check it out in person! Captivating book. Congratulations! I have a subscription from Ancestry.com which my son bought for me. i am very appreciative of this although I did know all about my background and ancestors. This does provide me with interesting information and I have encountered cousins whose lives i knew nothing about. I am pleased about this since it is meaningful. Hi and thank you! A subscription is indeed a great gift idea! I’m so glad your son got it for you and you’re enjoying it! Thanks for this fascinating post. Your information is excellent. Genealogy is so popular now. It is important to learn where we came from and who was before us. I was aware of my roots from my family when I was very young and am grateful to know. Hi! Thank you so much! I agree it’s important to know where we came from, and I, too, loved knowing about my ancestry from a young age. It’s fascinating! Your book sounds like something I'd like to cuddle down with on this snowy afternoon. I haven't done any research, but I did and do participate in 23 and me, with one astounding result. I discovered a first cousin once removed, the grandson of my mother's brother. He was born when his birth parents were in college, was kept a big secret from all the rest of my fairly close family, and was adopted. He since has done the genealogy research and has constructed our family tree back to 1750. He's shared all this with me, giving me access to his Ancestry account, and I have helped him with the odd question of age, marriages, progeny, etc. I couldn't wait to tell the rest of my cousins all about him, and did that ever make for an interesting Thanksgiving table conversation a couple of years ago. Hi, Ann! WOW. That’s amazing! Your cousin once removed has done a lot of work and that’s wonderful y’all have forged a relationship through it. Don’t you find it fascinating how the family traits show through? Its just the neatest thing to me. The book sounds fantastic, Stephanie! I've dipped into family history research long enough to know that it's a total rabbit hole I could get lost in for a long, fascinating time. The one thing I have learned is that my ancestors were not saints, but time makes that interesting, rather than shameful. I'm sure there are a lot of stories still to be told out there when past adventures meet with present standards of behavior. Hi, Gigi! Thank you so much! Yes, what a rabbit hole it can be! But such a fascinating one. And maybe even more so once one realizes their ancestors definitely weren’t saints, right? I think it makes them all the more interesting! Congratulations on the Malice Domestic Award - that is fabulous! I love genealogy mostly because my mom (librarian) has been doing all the heavy lifting in the research department for years so I just get the good stuff - the stories. We come from some rather colorful stock! I can't wait to read Murder Once Removed and even better to share it with my mom - she's going to love it! Hi, Jenn! Big fan of your books! All the amateur genealogists in my family have done all the heavy lifting for me, too, but the stories are fabulous. The more colorful the stock the better, I say! And thank you so much for passing it along to your mom. I hope she’ll enjoy it! Librarians are the best. This has been such an interesting discussion that I've not only ordered your book, but I'm thinking I may do the Ancestry.com DNA test, partly for the temporary subscription, and partly to see if the profile differs from the one I got from 23andMe. I can't wait to meet Lucy, and to visit Austin in her adventures. Why Austin rather than Houston, by the way? Deborah, I had both 23andme and ancestry. The Ancestry DNA is being really weird right now. I am grateful that I took the DNA test years ago because the ancestry dna showed more variations. For example, it included southern Europe and Ireland. Well, the new "updated" Ancestry DNA threw out most of the ethnic regions and increased the percentage of a ethnic group, when I know the percentage is wrong! LOL . The 23andme showed which part of the British Isles my ancestors came from. Hi, Debs! Thank you so, so much! My pub day was FANTASTIC — I got to launch at Murder by the Book — and my day was made even better by getting to be on Jungle Reds. We’ll have to compare notes once we get our DNA tests back. I’ve heard the two tests often differ because of the way the tests are run (or something like that), but that they’re generally correct. As for Austin rather than Houston — as much as I love my hometown, Austin is like a very large small town in many ways. There’s never a dull moment in Austin, and I thought it would be such a fun place to set a mystery. There’s also so many research facilities there. Lucy is in research hog heaven, for sure! Steph, welcome to Jungle Reds! Congratulations on the Malice Domestic Award and on your pub day! Yes, I found lots of interesting things in my family tree. Growing up, I always thought that my family tree was Scottish and southern Europe. I tried Genealogy research and U went to the National Archives. This person working there asked me which ship my immigrant ancestor came on. I said I did not know. I gave up on genealogy research until I read Alex Haley's guide to genealogy research for children. Presto! The first thing I remember was the suggestion to start with the most recent census. At that time it was the 1920 census. I knew that my grandfather was 39 when he died in 1950 so he had to be a kid in 1920. I found him in the 1920 census and discovered that his father worked at a feed store in Indianapolis. I joined a genealogy club in Washington, DC and we went to the Daughters of the American Revolution War Library. They helped me find out more about my grandfather's parents. The Workers Progress Administration had wonderful records for birth, marriage and death. I discovered my great grandparents' marriage recored. They married in 1906 in Indianapolis. And I found my great grandmother's full name. From there, I found out that my great grandmother was a descendant of Dutch Huguenots who emigrated to New Amsterdam before it became New York! From New Amsterdam, they moved to New Jersey, then some of their children moved to Conewago then the next generation moved to Kentucky then the next generation moved to Indiana! And my great grandfather's mother was half Irish and half German! The German ancestors came from Alsace and some were Swiss German! The other day I had an interesting conversation with a relative. Someone asked her if she was Irish and she said no. I told her that she would have some Irish DNA because I took my DNA test and it showed some Irish DNA. She said that she is more interested in family stories, not in DNA. She said DNA is too abstract. Through DNA matches, I have conversed with distant cousins and learned more family stories. I wonder how do you get family stories if you do not know where your ancestors came from? Question: Would Lucy take a DNA test? Hi, Diana! Thank you so much! Isn’t the DAR library in Washington, DC, amazing? It’s gorgeous, too. And the Archives — love! They are so knowledgeable there, and so helpful. I didn’t know about the Workers Progress Administration, though — thanks for that tip! And I’ve got some Dutch Huguenots in my line too! Genealogy is just fascinating. Nearly forgot — yes, in my mind, Lucy has taken all the DNA tests she can and is still searching for an elusive ancestor or two. I plan to have a book dealing with her ancestry in the future, so fingers crossed! Look forward to reading your book in hardcover. I received a digital ARC of your novel. Often when I am lucky enough to get a digital ARC from NetGalley, I buy a hardcover or paperback. Yes, genealogy is fascinating. One relative was nice enough to submit a DNA test and we discovered the Irish DNA to our surprise! Most of my relatives ARE not interested in genealogy, Another relative said she is interested in family stories, NOT in the abstract facts like family trees. She was not interested in taking a DNA test. Thanks for visiting Jungle Reds and for sharing your genealogy tips. I have dabbled on Ancestry.com, and did find most of my information from the census reports, which are pretty amazing. I learned that my maternal grandfather's father emigrated to the U.S. from Germany in the late 1800's and was a travelling salesman. I reached a dead end at that point - no leaf to be found - but I haven't given up. Murder Once Removed sounds like a wonderful book, and Austin is an awesome setting. I look forward to reading it! Hi, Celia! I’m glad you aren’t giving up. No doubt your maternal great-grandparents and beyond are out there, just waiting for you to find them. (At least, that’s how I feel about it!) And thank you so much! I hope you’ll enjoy it! I must admit I’m not that into ancestry stuff. But this new book sounds fascinating. Hi, Mark! I’m glad and I hope you’ll enjoy reading it! I've been tempted to visit the Clayton ever since one of their librarians gave a presentation at HMNS a few years back. I think my older brother is working on the family tree. I look at the diagrams and get instantly lost. How do you figure out who is a relative and who is an inlaw? I much prefer reading the letters and stories put together by some earlier generations to pass along. My dad had a cousin who did just that for the Huston family (my dad's mom). I don't know very many of them but had met a couple of Dad's aunts and uncles. One aunt never married and was a missionary in China and Japan for many years. She was interned during WW2 by the Japanese. Another uncle actually went "over there" in WW1 and was out in the field when armistice was declared. My Mom's family put together histories and remininsces from the generation who were her parents, uncles, and aunts. Very interesting. Debs, did you know there were hooligans that ran around the Plano area who called themselves Red Caps and threatened farmers who tried to pay cash rather than barter? There were a lot of great stories from the Rawlings crew. I look forward to reading your new book Stephanie! I lived in Austin a couple of times in the past, as did my parents. Hi, Pat! The Clayton library is wonderful and really helpful. I’m so glad your family wrote down some of the stories! It’s so important to preserve that history. You sound like you’ve got a lot of interesting people in your family tree AND they were smart enough to write it down. Kudos to your family! Hi again! I looked at my family tree and it looks like I have a 8th great grandmother named Mary Perkins, who was born in 1673 in Hampton, Rockingham, New Hampshire. Oooh, I don’t know that I’ve got any New Hampshire Perkins in the family, but it’s possible. My tree has been in America since 1633, so you never know! My great aunt on my Dad's side researched his side of family and gave all of us a bound copy of her findings. It was interesting to find out that they changed the spelling of their last name when they came from the Netherlands in the early 1900's. Book sounds fascinating, looking forward to reading. The evolution of some names fascinates me! I know it was usually because of a lack of formal education that made them not know how to best spell their names, or because their writing was terrible and someone misread it, or just because others kept butchering the spelling and they gave up and changed it, but it’s still interesting! My brother tried to trace our heritage many years ago. He gave up because they used the same names with no Junior or Senior. Also if a child died, they reused the name. That was before DNA and all these websites. Hi, Sally! Your family sounds like my friend’s, who once went on a hilarious tirade about how many Michaels were in his family. (There were A LOT.) I hope you’ll keep looking, if only for the fun of it! Shalom Reds and fans. I will look for this book Stephanie. I am not so interested in my own genealogy but I love the stories that genealogists and amateurs tell. Henry Louis Gates’ program on PBS has gotten mixed reviews but again I like the stories. There is a great YouTube channel called Family History Fanatics which I love watching. I think they are members of the Latter Day Saints. I understand that the Mormons have huge databases of genealogical records. I did do a 23andme test kit. Not too many surprises but I did find that I had one second-cousin (probably sharing a great grandparent) who had done the test. I enjoyed reading all the comments today. Hi, David! I, too, have enjoyed all the comments today! And the LDS bank is the absolute tops for genealogy. It’s a place I’d love to visit. I also like Henry Louis Gates PBS program, and Who Do You Think You Are?, just for sheer entertainment. But thanks for the YouTube channel tip! I’ll have to look up Family History Fanatics. I find family history & genealogy fascinating, but I've never wanted to actually do any of the research. I love listening to my mom & aunt tell stories from when they were kids. Hi, Jana! Me too! All those stories I’ve heard over the years were always so fun. Hi Stephanie, the book sounds just great and congratulations on the Malice Domestic Award! I haven't yet done much genealogy research, but other members of my family have. And, a few years before she died, my grandmother took a trip to NYC with one of my aunts specifically to go to Ellis Island. Where she was able to see her mother's signature in the arrivals log. Which I thought was very cool. And I should go myself one of these days! Hi, Melanie! Thank you so much! Wow, how cool to see her mother’s signature at Ellis Island! That would give me the best kind of chills. I haven’t been to Ellis Island yet, but it’s on my bucket list for sure! This sounds like such a fun and interesting book; I'll be looking for it, for sure. When I started researching my partner's family history I reached out to the genealogical society from the region where his family had roots and received a letter in "old lady handwriting" from a woman who turned out to be his great-aunt's daughter-in-law. She knew all kinds of family stories, my favorite of which was about the great-great grandmother who was an informally trained midwife/medicine woman and her husband who had brilliant blue eyes and striking white hair. They were devout Christians, according to her, and answered the call of anyone in need, without regard to their situation or circumstance. Made me wonder if some people thought a good Christian lady ought not insert herself in some birthing situations or medical dilemmas...I'll bet there is a story there. Oh, how I wish everyone kept journals! I enjoyed my correspondence with her, our distant cousin, for a short time before she passed away. I was very glad I didn't miss my chance, and sorry I didn't start my search much sooner, wondering how many other stories she had to tell. I did want to add that the Family History Centers at local LDS Churches are great resources for anyone wanting to do family history research. Anyone can go there and they have volunteers who have been trained to help point people in the right direction to find the records of their ancestors. You don't need to go the Salt Lake City, you can just look up The Church of Jesus Christ of Latter Day Saints in your phone book (if you have such a thing--I'm really dating myself!) and find out where your nearest Family History Center is. Hi, Beth! His 2x great-grandmother sounds incredible. Definitely a story there! Have you ever read Edith Maxwell’s Quaker Midwife mysteries? They might be up your alley after that story. But I think it’s just wonderful you got in touch with your distant cousin and exchanged those stories. She no doubt loved it too! And I agree about the LDS churches! That’s a great tip for anyone, and they have such good information. Thanks so much! I found my paternal grandfather was married prior to marrying the grandmother I knew. No one ever spoke about this so it is not a common known fact. Hi, Beth! The oh-so-interesting things we find out when we do our genealogy, am I right? ;) We’ve found some surprising things in our family, too, but it all makes it that much more fascinating — though I do wish I knew more of the reasons why on some of them. It’d be interesting to find out! The reason for the 72-year rule for release of Census records is to protect the living. My 90-year-old aunt is alive today, but no one else in her family at the time of the 1940 census is. Hi, Willetta! That’s what I thought about the 72-year rule on censuses, but since I couldn’t remember where I’d read it, I wasn’t 100% sure. Thanks so much for letting me know! What The Heck? I Don't Understand This. Did You Ever Want to Be a Rock Star? Mentoring Eighth Graders: What Would You Say?